he final phase of construction at Remington Hills is underway! Located off Highway 96 in Zebulon, North Carolina, home construction is expected to begin immediately on half of the projectâ&#x20AC;&#x2122;s 22 lots. Homes will be on the ground in various stages of development by Summer/Fall 2019. Similar to the homes constructed during Phase 1 and 2, Phase 3 will feature slightly larger homes averaging 2,000 square feet and lot sizes of 0.75 acres. Prices will start in the mid-$200,000 range and some new home plans will be introduced during this phase of construction. We are very excited to continue this project at Remington Hills. Visit our website at www.homesbyford.com for more information and pictures of our homes! Hello Everyone! I am so excited to finally announce that development has begun on Phase 3 in Remington Hills. We have had so much interest in this next and final phase, even from current homeowners that are looking to move up within the same neighborhood. The wet weather that seemed to be constant over winter has certainly caused a lot of scheduling issues, not only with Remington, but in all areas of construction. I encourage you to keep your eye on our website as updated news becomes available. As soon as the lots are ready, the company plans to move pretty quickly with home construction. There will not be a lot of opportunity for presales, as we plan to start building on half of the lots immediately. This newsletter issue will provide you with some general information about Phase 3 and what to expect. See you in the summer! 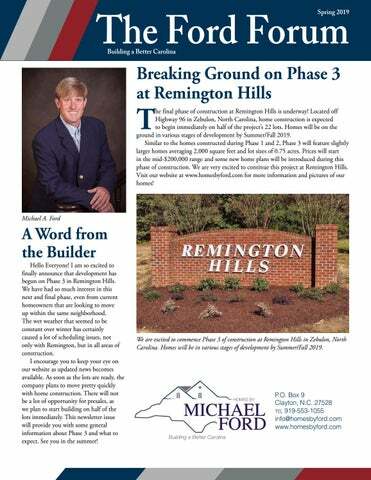 We are excited to commence Phase 3 of construction at Remington Hills in Zebulon, North Carolina. 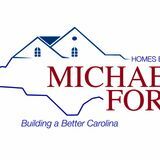 Homes will be in various stages of development by Summer/Fall 2019. According to the state's official website, what is Idaho's nickname? Every career comes with a few—or more—setbacks. You can’t avoid them, so you have to learn how to deal with them and bounce back. From the CNBC’s Make It website comes this advice for recovering from even the toughest failures: • Learn and adjust. When a disaster strikes, even a small one, take the time to figure out what happened. Then you can adjust your strategy so it doesn’t happen again. • Help other people. If you’re generous with your time and expertise, people will willingly help you out when you fail. Make a point of assisting your co-workers and friends so they’ll feel inclined to return the favor when you need them. • Focus on what you can control. Obviously, some things are beyond your reach. Don’t worry about them, and keep your mind on what’s in your control. This will help you move forward. • Keep the faith. Remember that you’ve succeeded before and will again. Think of the setbacks you’ve survived, and remind yourself that you didn’t give up then. Next, commit yourself to action. • Find allies. Surround yourself with people who not only help you, but encourage you. A circle of positive people who believe in you can give you the confidence to keep going in spite of failure. • Accept responsibility. Don’t blame others for your failure. Maybe they broke promises, but in the end, the responsibility for fixing things is up to you. Own up to your mistakes honestly, and share what you’re doing to rectify them today and avoid them in the future. No matter what your job title is, you have to earn the respect of your colleagues, supervisors, and employees if you want to succeed at work. Here are some guidelines for ensuring that people take you seriously: • Fine-tune your appearance. Pay attention to how others in your organization dress, especially upper level executives, and model your style after that. Keep your hair neatly trimmed. Resist the temptation to dress too casually. • Take notes. In meetings and when talking to managers, make a point of writing down the important points. This will help you remember what’s said, of course, but more important, you’ll show you’re paying attention and taking other people seriously. • Speak authoritatively. Eliminate “uh” and “um” from your vocabulary. Don’t try to come across as an obnoxious know-it-all, but concentrate on speaking clearly. Good communication builds credibility. • Stay organized. A neat workspace shows that you’re efficient and detailoriented. Clean it regularly and discarding what you don’t need. • Be patient. Time is a limited resource, but don’t obsess over speed. Impatience strikes many people as evidence of immaturity, so temper your urgency with understanding. If your workforce operates in hazardous conditions, you know that the best protective gear available is worthless if your employees won’t use it. To encourage workers to wear their equipment, follow this advice: 1. Reduce the need for protection. Look for safer ways to do things so that extra protective equipment isn’t necessary. This will emphasize to your workers that their safety is a No. 1 priority. For example, before purchasing heavy-duty gloves to protect workers’ hands from a caustic cleaning solution, investigate alternative cleansers. 2. Involve employees in safety decisions. People feel more committed to policies they have helped shape. Include employees in selecting equipment; connect them with vendors so they can ask questions and receive the information they need. 3. Educate and train your workforce. Many times, employees don’t use their protective gear because they don’t know how—or even more important, why. Provide sufficient training so that employees understand the risks associated with not using the equipment. Once they fully understand what’s at stake, workers will be much more likely to support the proper use of prospective equipment. 4. Reward and reinforce safe behavior. First, be a role model and actively use the same gear you expect your workforce to take advantage of. Spotlight situations in which using the equipment correctly prevented an accident or saved a life. And whether you reward workers with gifts or just words of praise, make sure they know you’re paying attention to their safety habits. 5. Check the fit. Workers may “forget” to wear boots or gloves because they don’t fit well. As much as possible, let employees select their own equipment with an eye toward what they’ll feel comfortable wearing and using. Feedback is more than saying “Great job!” But you knew that (right?). Remember that effective employee feedback includes these elements: • Description. Tell employees what they did right (or wrong) in specific terms. • Immediacy. Give feedback as soon as possible after the employee’s performance. When you have to correct mistakes, though, do so in private to avoid embarrassing the employee. • Honesty. Don’t sugarcoat negative feedback. Employees will either see through it and stop trusting you, or they won’t—and they’ll keep making the same errors.